Los Angeles CBD is a thriving commercial hub comprised of 15 districts: Skid Row, Civic Center, Little Tokyo, Old Bank, South Park, Historic Core, Gallery Row, Fashion District, Arts District, Warehouse District, Jewelry District, Industrial District, and Toy District. Bunker Hill and the Financial District are also part of downtown Los Angeles and are considered the city’s business core area. 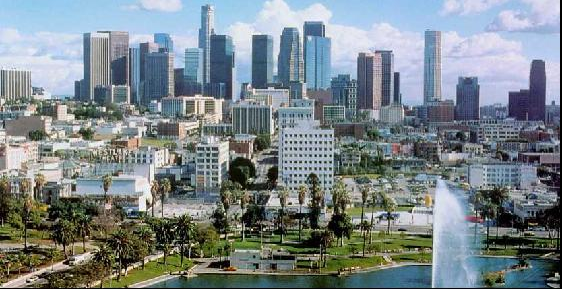 Los Angeles’ CBD was first defined as a business district in 1920, and was expanded and redeveloped during the 1950s and 1960s, when several high-rise office buildings were added to the city’s urban landscape. Downtown LA is easily accessible by road and mass transit, as the area lies at the intersection between the I-10, I-5 and I-110 roads, and is served by 4 Metro lines. Union Station is located on the northern edge of the CBD, and Los Angeles International airport is only 19 miles away from the downtown area. Unlike other US business districts, downtown LA has a large (and growing) permanent population. In 2016, more than 50,000 people lived within a 2-mile radius of the CBD, and particularly in the eastern fringe, where many office buildings have been converted into residential units. Since the late 2000s, the local authorities have launched several initiatives aimed at revitalizing the CBD’s economy and boosting its appeal as a world-class business destination. Among those initiatives we can highlight the creation of Downtown Center Business Improvement District, which has proven successful in attracting tech startups and property investors. According to a report published by Beacon Economics, Los Angeles CBD contributes more than $28bn a year to the city’s economy. The area’s economic base has been growing steadily since 2006 and has managed to rise up to the challenges caused by global economic uncertainty. Currently the CBD is home to 7.5 per cent of all the city’s registered businesses. Leisure and hospitality is the leading source of employment and income in the CBD. There are nearly 9,000 hotel rooms within the CBD’s boundaries, as well as world-class business facilities like the Los Angeles Convention Center and the Expo Hall. Along with leisure and hospitality, tourism has an important impact in the CBD’s economy, as this industry sector generates approximately $30bn / year in revenues. The fashion industry (mainly clustered around the Fashion District) employs more than 85,000 people, and is another key economic driver along with retail, the arts, and entertainment. In recent years, several e-commerce firms have established themselves in the CBD, capitalizing on the presence and reputation of the Fashion District. Other fast-growing industry sectors are healthcare, transportation, logistics, and warehousing. The CBD’s total commercial real estate inventory consists of 32 million square feet of office and retail space. The office market in downtown LA is mainly clustered around Bunker Hill and the Financial District, where average rental rates are back to pre-recession levels at approximately $32 / square foot. However, high office vacancy rates are a trait of the local office market and usually hover around the 20 per cent mark. This may be attributed to the fact that many office occupiers are early adopters of the new trends that are changing the way companies allocate and use office space, privileging small units and flexible working arrangements over traditional office space. Across the CBD, there is strong demand for what developers and real estate agents have called “unusual office space”, which includes former industrial units and lofts. Demand for this type of office space is especially strong within the TAMI sector and in areas like the Arts District and Little Tokyo, which are quickly becoming an alternative to established business districts like Bunker Hill. Given the strong residential character of Los Angeles CBD, the local retail market is mainly occupied by shopping malls, supermarkets, and grocery chains. Being one of the most attractive urban retail destinations in the US, properties in the CBD command average rental values of $2.64 / square foot and have consistently low vacancy rates of around 6 per cent. In the near future, several large-scale mixed use developments will be added to the CBD’s commercial real estate inventory. The most notable developments include projects like Metropolis, 1200 Figueroa, and Oceanwide Plaza, which are set to become the largest developments of its kind in the west coast of the United States. Further reading on the top CBD’s in the USA. This entry was posted on Wednesday, November 23rd, 2016 at 2:00 pm	and is filed under Best Cities for Business in the USA, Business Districts, Business Spotlights, Business Start Ups, CBD's. You can follow any responses to this entry through the RSS 2.0 feed. You can leave a response, or trackback from your own site.